Amaya Young, 12, knows she’s doing something special. 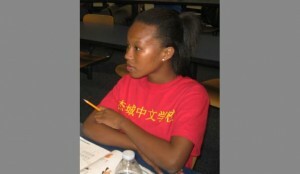 Every Sunday she is one of four African-American youth who spend two hours in a classroom learning the Chinese language. She is the only one of her group of Jacksonville friends who know any Chinese words, she said, and she is proud to be expanding her horizons on an international level. She beamed when she successfully said hello and introduced herself — in Chinese — to a visitor. “Ni hao, wo jiao Amaya Young,” she said. Amaya looks forward to every class. “I want to learn more about the language and the culture,” she said. Most of the students in the Jacksonville Chinese Association’s weekly classes at the University of North Florida are members of Chinese “heritage” families eager to keep the language alive in their homes, said Principal Yan Li. But Amaya, who attends Darnell-Cookman Middle/High School-School of the Medical Arts, is learning Chinese because of a partnership between the association and the AnnieRuth Foundation, a Jacksonville-based nonprofit that focuses on education, health initiatives and economic development. “Diversity and inclusion are a part of our core values. Because we cater primarily to inner-city families, it’s important that we offer programs that enable participants to understand the value of interacting with people of different backgrounds and cultures,” said Executive Director Dee Wilcox. The partnership emerged after Wen Raiti, president of the association, contacted Wilcox to talk about the foundation’s programs. During that conversation, Raiti invited foundation youth to join the Chinese school. “Having children with different backgrounds enroll in the school would be of great benefit to both the American children and the Chinese children, Raiti said. The foundation students are Amaya and her brother, Omari, 10, and siblings Jadyn Bow, 7, and Jace Bow, 5. Sonya McLaurin, Amaya and Omari’s mother, volunteers for the foundation. Having her children learn Chinese, she said, was a nod to her own Asian heritage and their futures. Having knowledge of the Chinese language also would be a plus on their college applications, McLaurin said. The association — founded in 1996 as the Jacksonville Chinese Professional Club — works to “build community through culture and service, to strengthen the cultural exchanges between China and America and to promote mutual understanding and friendship with local American people,” according to the association. In 2003 the association began offering Chinese classes. The classes later moved to a church, then to UNF. This year there are about 85 students, but they have had as many as 120. Capacity is about 150, Li said. She and the school’s six teachers are all public school teachers in Duval or St. Johns County. At the beginning of the semester, students are placed in one of 10 levels depending on their age and abilities. They transition to higher levels as they progress. In the Level 1 beginner class, lessons focus on greetings, asking questions, introducing themselves, buying grocery and ordering food. Games are incorporated into the curriculum, but students must speak the Chinese language as they play, according to the association. 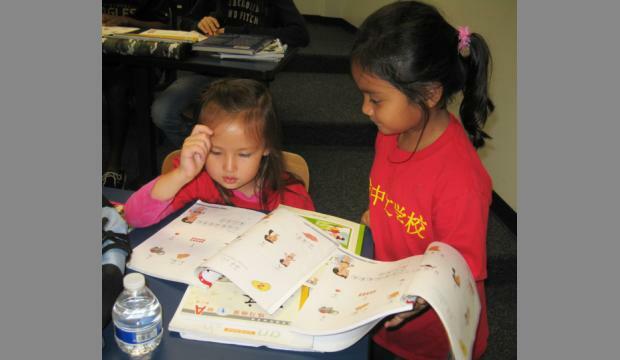 Many of the “ABCs” — American-born Chinese students — learn some of the language at home. Some of them end up with an English-tinted version, which Li called “Chinglish.” Some of them learn a different dialect, Cantonese. But the goal is for them to speak, read and write Mandarin Chinese, the standard form. Some of the young children in Chinese “heritage” families have to be dragged to class but later become more appreciative. Yan Li’s children attended the classes and are now in college and “are so glad they can speak” the language, said the principal. Many of the “American” kids, such as Amaya, are more motivated from the start, said another teacher, Yan Shu. “They really want to learn,” she said. Learning Chinese is just one of many enrichment programs for youth at the AnnieRuth Foundation, Wilcox said. The foundation was founded in 2012 and is named after Wilcox’s late grandmother. The foundation has a health and wellness program, summer internship program for youth, parenting network, nurturing parenting curriculum and seniors network, among other things. Future plans include moving into a new building and adding youth leadership development programs. And the bilingual youth will be extra prepared for college and career.